Spring Fest with Jeff & Paige! UPDATE: Thorne Spring Fest with Jeff & Paige has been postponed to Monday, April 15th due to weather! This event has reached max capacity. If you already registered and can no longer make it, please cancel your registration in Eventbrite so that families on the waitlist may attend. Thank you! Looking for something fun to do with your children on BVSD’s Spring In-service Day on April 15th? Hop into Spring with Thorne Nature Experience at the Sombrero Marsh Environmental Education Center. 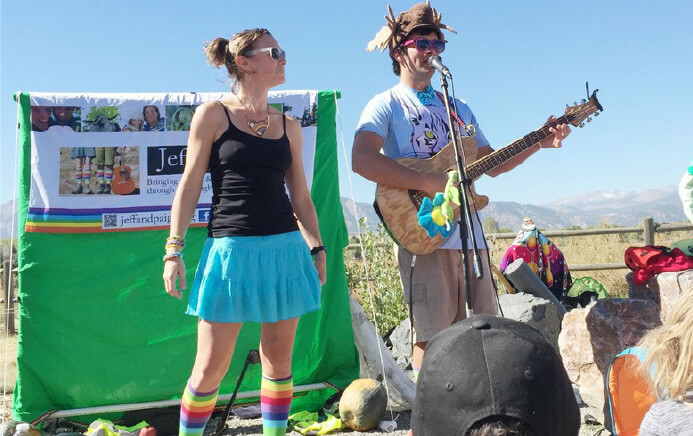 We will have nature explorations around the Sombrero Marsh with Thorne staff, face painting, nature crafts, and dancing and singing in rainbow socks with our favorite nature performers Jeff & Paige! Pack a picnic lunch and blanket to sit on and enjoy the mountain views. Please plan for the weather as this event is mostly outdoors. Bring sunscreen, layers and water. Registration is Required and this event is at max capacity! CLICK HERE to join the waitlist or cancel your reservation in Eventbrite. Follow Thorne Nature on Facebook, Instagram and sign up for our email list for nature news, community events, opportunities, and more!